A homemade antenna plan for a portable yagi beam antenna for the Six meters. Consist of a 3 elements yagi beam design include antenna dimensions, with elements lenght and spacing. Two Yagis for six meters band, one 1 wavelength long with a gain of 9.5dBd, and the other a 2.1wl model with a gain of 11.8 dBd. 10 elements yagi for 50 MHz - A homemade 10 element Yagi Beam Antenna for 50 Mhz by Rod Mackintosh, a NBS Yagi on a 13.2 metre boom. 2 element Yagi for 50 MHz - This 6 meter 2 element yagi antenna is simple, compact and effective antenna for 50 Mhz. The design antenna was optimized with AO for best match to 50 ohms, no matching network. A choke balun is recommended to decouple feedline currents. 2 elements Folded Yagi Antenna for 6 Meters - 50MHz Collapsible 2 Element Mini Beam antenna, an overview the development of the 6MBA. 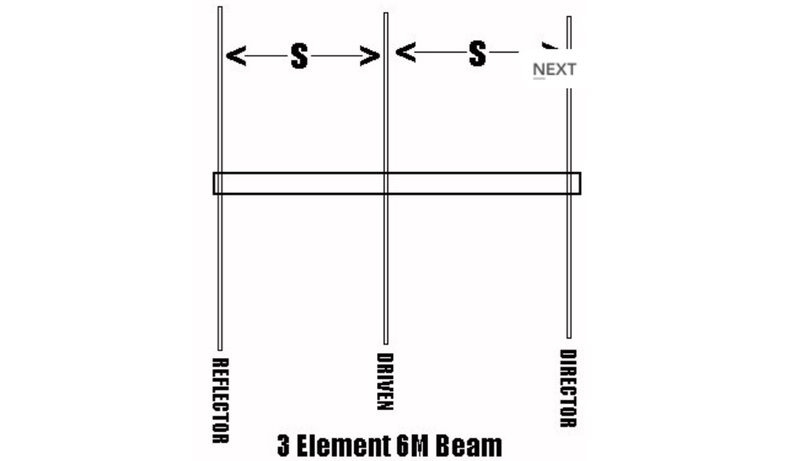 3 Element Beam for 50 MHz - A six meter band 3 element yagi beam antenna project with shortened elements using coax cables with the outer ends stripped and the center conductor shorted in somewhat of a Bazooka antenna. 4 el yagi for 50 Mhz - The EF0604S is a compact 4 elements yagi antenna plan for six meters band featuring 8.77 dBi gain and a front back gain of 17.89 dB. Article includes elements dimensions and spacing, along to pictures of some homebrewed examples. 50 Mhz yagis - Three Yagi antennas for the six meters band by 9A7PJT. Include a 4 element yagi, a custom design 4 element, and a 5 element yagi with antennas pictures and design. A portable three element 6M yagi - A homemade antenna plan for a portable yagi beam antenna for the Six meters. Consist of a 3 elements yagi beam design include antenna dimensions, with elements lenght and spacing. Homebrewing a 6 Meter Yagi - In this PDF article Zack Lau describe how to homebrew a four element yagi beam antenna for 50 MHz band, including how to build mounting blocks and tubing clamps to hold elements. Search only in "Yagi Antennas for 6 Meters band"
A collection of Yagi antenna projects for the 50 MHz (6 meters) band. Homemade 6 meter antenna.